Traver’s history with near-to-eye, VR and AR headsets goes back about 30 years and the 5 companies he has founded along the way. Vuzix is his most successful company which now employees 80+ people and continues to expand office and manufacturing space.The company currently offers two primary end-use products, their M-Series of enterprise smart glasses and the waveguide-based Blade, which can address both enterprise and consumer users. On the M-Series side, Vuzix is now quoting new orders in the 5K and 10K range, as trials start to move to enterprise-wide deployments. For the Blade, there is widening interest from many of the company’s enterprise customers, including major global telcos that see it as an ideal product for their pending 5G launches, in addition to online orders they are already receiving from developers and consumers.Vuzix explained they also have a series of new products in development that will utilize next generations of their waveguides and there are OEM partners that are looking to also use their waveguides. As a result, ramping up waveguide production is critical for their success. The Vuzix waveguide technology is based upon a surface relief approach pioneered by Nokia. This technology was licensed to Microsoft for their Hololens and to Vuzix for their Blade headset. WaveOptics also is pursuing a surface relief approach to waveguide fabrication while DigiLens prefers a volume Bragg grating approach. All these waveguide approaches feature an input grating which takes the light from a pico-projector and couples it into the waveguide. In the Blade specifically there is a turning grating section that helps guide light in the waveguide and turn it toward the output grating, which is sometimes called a pupil expander. It takes the small pupil of the pico-projector and increases the size in front of the users eyes to allow comfortable viewing of the image. The grating design/layout and the projection engine itself defines optical characteristics like the field of view, eye box and eye relief. The waveguide in the Vuzix Blade is a two-waveguide solution: one for the blue-green and one for the green-red portions of the visible spectrum. These waveguides need to be aligned and parallel to micron tolerances to avoid color shifts at image edges. Achieving this is one of their secretive process innovations. In simple terms, Travers explained that to make the waveguides, they must first design and fabricate a “master.” This master is coated with a photopolymer and “pressed” onto a blank glass substrate and exposed to UV light. This solidifies the photopolymer, creating a perfect imprint of the grating master. 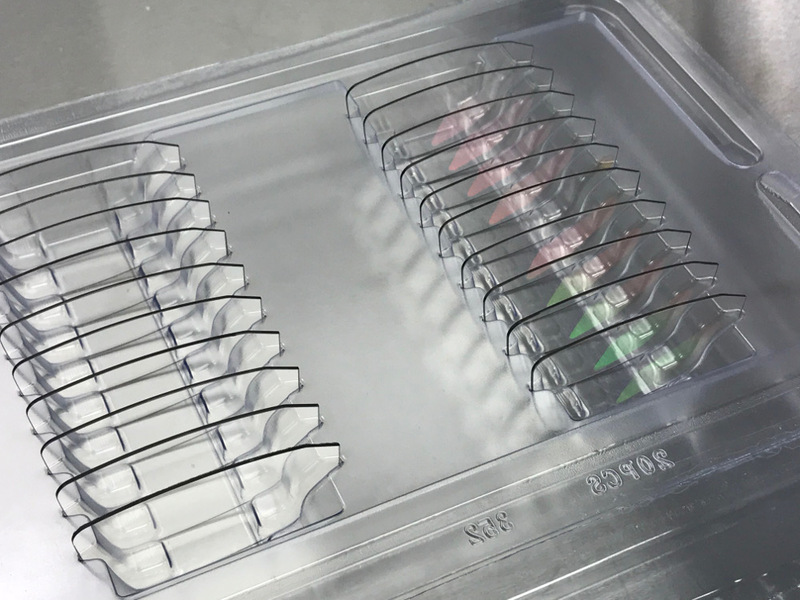 Vuzix has optical engineers that can design surface relief gratings in house and the bulk of the processes to produce the master are done in house. This master is good for thousands of imprints. Travers then showed us the key alignment and imprint/exposure tools. Nanoimprinting is a larger machine and alignment is a small machine with a footprint that is no bigger than a few square feet square. Both are fully robotically controlled, performing a complete exposure cycle in about 1 minute. 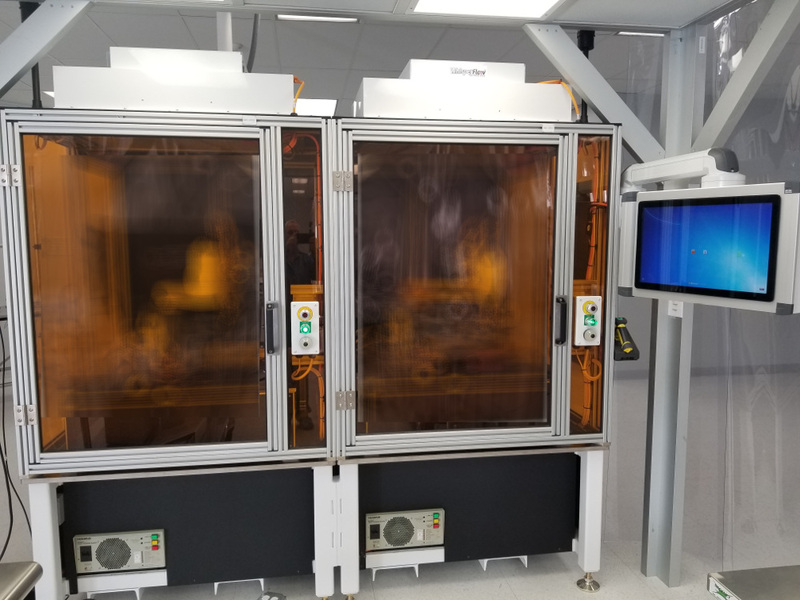 Vuzix is constantly working to reduce cycle times and improve processes and some of the new process equipment I saw on the plant floor were just being brought on line. Other parts of the manufacturing space are devoted to lamination of the waveguides, optical analysis of the finished waveguides and assembly of the Blade AR headset, along with other AR headsets the company offers. The Blade headset features two waveguides that are powered by a TI based DLP high contrast pico-projector. This allows for the display of a 28-degree diagonal FOV. The graphic below provides the key technical features and specs. It is available now for $999. One of the next gen products Vuzix is working on will supply dual projections engines for stereoscopic viewing. These are more consumer-oriented applications, but so far, most of Vuzix’ applications have been on the enterprise market. The Android-based Blade headset is supposed to open up the consumer market for them. 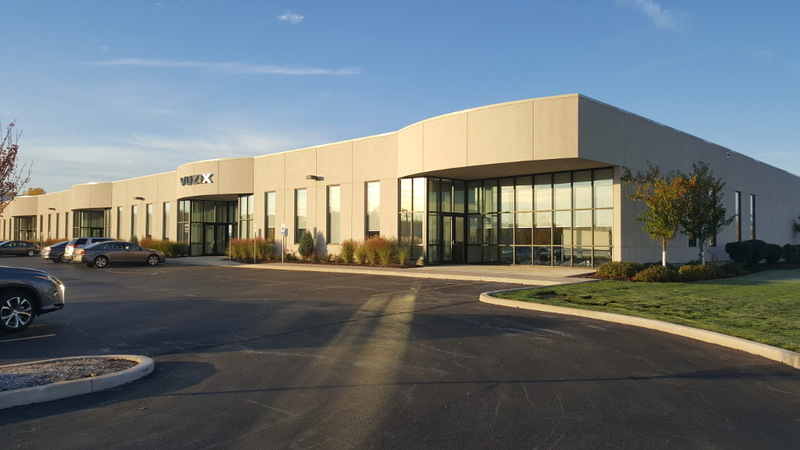 During my visit with Vuzix in Rochester, I got to have more time with the headset, exploring how to use it and some of the applications one can use. The Blade does not try to do everything in the headset. Instead, it is a tethered accessory for your mobile device. 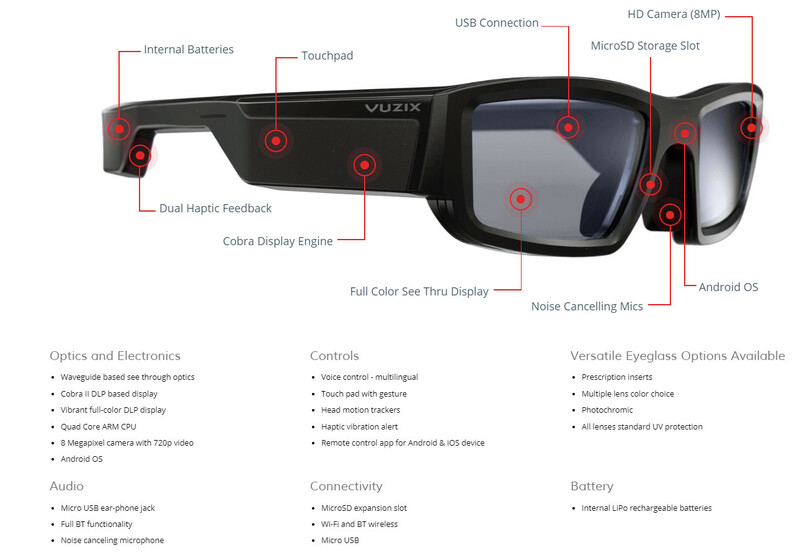 As a result, Vuzix has one of the best application ecosystems for consumer and enterprise uses any AR headset. The Blade Companion App, available in the App Store or Google Play, enables easy setup and customization of the Blade headset including managing Wi-Fi connections and pairing the Blade Smart Glasses to your phone. There is also a Blade Beta store for the more adventuresome. 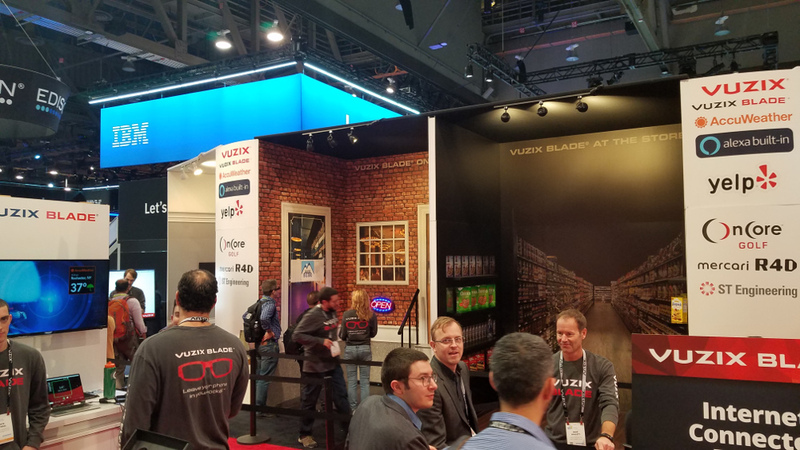 The Vuzix Blade ecosystem of consumer-oriented applications is expected to grow significantly throughout 2019 – ranging from utilities to entertainment with applications like karaoke, language translation, sheet music scrolling and more. Also included on the Blade Smart Glasses are four fun games designed exclusively for Vuzix, including AR Dino Hunter, AR-Golf, AR-Racers, and an idle AR Space-Miner game. Coming soon – Amazon Alexa for the Blade. Until there are compelling consumer AR use cases, I believe the enterprise market is the key to market adoption of AR headsets. But the key to AR headset adoption is the establishment of AR use cases using mobile devices. Devices like the Blade will then provide a bridge to enable hands-free AR use cases. My tour of the Vuzix facility has me excited about the potential for AR.